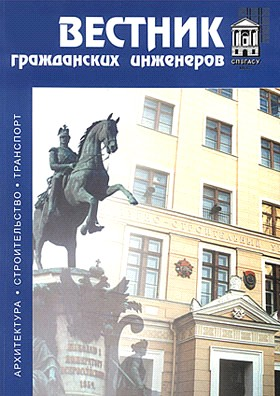 Scientific-technical journal “Vestnik grazhdanskikh ingenerov” represents a whole range of research works carried out in the oldest Russian and post-soviet university of the architecture and civil engineering profile - Saint-Petersburg state university of architecture and civil engineering established by the order of the Russian emperor Nickolas I in 1832 on petition of the Internal affairs as “School of civil engineers” (“grazhdanskikh ingenerov”). The journal was instituted in SPSUACE in 2004 and was registered by the Federal agency for supervision in the sphere of mass communications and conservation of cultural heritage of the Russian Federation. Certification of registration of mass media ПИ № ФС 77-18997 issued on 29.11.2004. In the journal results if scientific researches are published by scientists, professors and specialists of SPSUACE and other scientific and educational institutions in the sphere of architecture, construction, automobile transport, ecology and environment protection, humanities and natural sciences, new information technologies and social and economical problems. The journal also covers the public life of the university, its history and formation as well as development of Russian architecture and construction. Since 2008 the journal has been included into the List of Russian scientific journals under review which must incorporate basic scientific results of PhD and D.Sc. degree theses. Based on the decision of the State Committee for Academic Degrees and Titles of 19.02.2010 the journal was included into the new list of publications. Periodicity of journal publication - 6 issues per year. Subscription index according to the catalogue “Rospechat” - 38532.